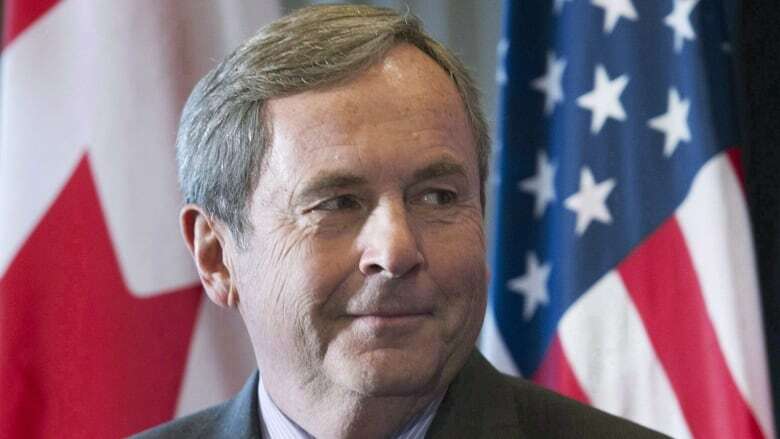 Canada's ambassador to the United States, David MacNaughton, tells a Toronto audience that NAFTA talks are unfolding as expected and while "heated" at times they remain constructive. He also predicted some "drama" ahead but said Canada-U.S. relations are in good shape. Canada's ambassador to the United States, David MacNaughton, says NAFTA renegotiation talks have been "heated" at times and that while progress is being made, there is plenty of hard work ahead. MacNaughton gave his take on the North American Free Trade Agreement talks between Canada, the United States and Mexico during a lunchtime speech at the Canadian Club in Toronto on Tuesday. He said round three, which kicked off in Ottawa over the weekend, is unfolding "pretty much as we expected." "Increasingly they're getting down to, as we used to say, talking turkey. And some of those conversations, I think it's fair to say, have been more than a little heated," said MacNaughton. He went on to say that overall the tone has been constructive and that he's optimistic that the end result will be good for Canadians, Americans and Mexicans. He acknowledged, however, that there is uncertainty about the outcome. "I have no crystal ball. And neither does anyone else," said MacNaughton. U.S. President Donald Trump calls NAFTA the "worst trade deal ever made" and has threatened to terminate it. He complained on Twitter after talks started that Canada and Mexico were being "very difficult" at the negotiating table. MacNaughton told the Toronto audience that Prime Minister Justin Trudeau and Foreign Affairs Minister Chrystia Freeland have made Canada's priorities clear, that they are "firm," and that Canada's negotiators are strongly defending Canada's interests. One issue that Canada prioritized has to do with cross-border labour mobility. Canada wants to update the list of about 60 occupations in which people can more easily get work permits or visas to work on the opposite side of the border. That's not a shared goal with the Americans, whose president is pushing strong anti-immigration rhetoric and policies. MacNaughton said while it's true that the Americans "didn't exactly embrace it, they are considering what we've put on the table." That could be interpreted as encouraging news to businesses on both sides of the border that have been asking for more flexibility for workers. The ambassador then advised Canadian businesses to engage their American counterparts, to use their contacts and relationships to encourage them to press the U.S. to realize that increasing labour mobility is good for both countries. "I hope we can make progress on that. I think we have to because so much of our economy is now dependent on services not just on goods," said MacNaughton. The ambassador said the Canadian business community, along with the federal and provincial governments, has been helping with a "Team Canada" approach to beating back protectionist sentiments south of the border. That co-operation needs to continue as the NAFTA renegotiations move forward, he said. He cautioned against framing the renegotiations as a game between the three countries with winners and losers. The real goal should be creating a more competitive North America in an increasingly competitive global economy. "If we spend our time trying to fight a zero sum game on trade, all of us will be losing," said MacNaughton. He and Canada's other representatives in the U.S. have been working hard to make sure that American legislators in Washington and beyond understand the value of Canada-U.S. trade, MacNaughton said, and the engagement strategy is "starting to work." "The only thing that I will predict, with 100 per cent certainty, is that before all of this is over, there will be some drama. Not saying where it's coming from," he said to laughter, "But there will be some drama."